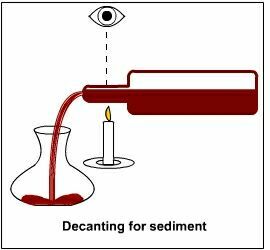 The Basics: When To Decant? Good news, casual wine drinkers: in almost all cases, you will have to remember nothing about this post. When drinking 95% of the wine currently on the market, decanting will be completely irrelevant, unless you simply enjoy doing it as part of the formal ritual of drinking wine (yeah, I don’t either). But for that other 5% of wines, it does serve some useful functions. Your typical decanter: the surface area maximizer. This does not apply to every wine of a recent vintage; it ONLY applies to wines that have to age for a long time before hitting their peak drinking window when you’re trying to drink them before that peak. When wines age, they interact with that little bit of air in the bottle between the fill level of the wine and the cork (called the “ullage”, if you’re curious), which over time causes the tannins and other compounds in the wine to soften (and eventually break down), making the wine more approachable and easy to drink and helping it develop secondary flavours. These changes in the wine are caused by oxidation, which in bottles of wine happens slowly and gracefully due to the very limited amount of oxygen in the ullage. If you have an ageworthy bottle of wine that’s meant to be drunk in 15 years and you’re opening it after 3, this softening/developing process won’t have advanced very far and you’ll likely be faced with a tight, closed, hard, tannic monster that won’t showcase its true potential. In order to make it more drinkable immediately, you essentially need to accelerate the aging process, and the most effective way to do that is to rapidly expose the wine to as much oxygen as possible (which is why they call it letting a wine “breathe”). This is where the decanter comes in. Its squat shape is designed to expose as much of the surface area of a wine as possible at once to the open air, especially when the wine inside it is swirled around. If you pour the wine into the decanter quickly and forcefully, letting it glug out of the bottle and slosh around (if “glug” isn’t a verb, it should be), this will bring even more air into the equation, all of which will help the flavours of your young wine fully reveal themselves and soften up its structure so you can enjoy it ahead of schedule. Simply popping the cork and leaving the wine in the bottle to “breathe” does basically nothing, because very little of the surface area of the wine actually interacts with the air. I should say again: all of the above only applies to young wines with far-off maturity dates — most wines of recent vintage are meant to be opened within 6 months and have absolutely no need of decanting. Your bottle of 2010 Yellow Tail does not need decanting to show its inner wonders; your bottle of 2007 high-end Bordeaux probably does. Separating sediment. Thanks to the 21st century, you aren't stuck using a candle anymore. When you leave an ageworthy wine alone for a few years until it is ready to drink, you may notice that the wine’s natural aging process has a particular side effect: sediment. As the tannins, colour pigments and other compounds of a wine age, some of them actually crystallize and separate out from the wine in solid form. This is sediment, which in red wines is a grainy, silty, bitter deposit which usually shows up in your glass if you get the last one of the bottle. Sediment isn’t harmful and is generally considered to indicate some level of quality in the underlying wine, but it tastes gross and definitely detracts from the overall drinking experience, so many people decant older wines in order to separate the sediment from the rest of the wine. There is a specific way to do this. First, you stand the bottle upright for a few hours to let all the sediment settle on the bottom. Then you SLOWLY pour the wine into a decanter with the neck of the bottle beside or over a light source so you can see what’s coming out of it. Once you get near the end of the bottle, as soon as you see the sediment come up to the neck of the bottle, you stop pouring. Voila! The key thing to note about this type of decanting is that the goal is NOT to introduce any more oxygen into the wine: it has already aged enough and doesn’t need any more help on that front. Therefore, when you decant aged wine, you shouldn’t glug the wine into the decanter, you shouldn’t swirl the decanter around and you shouldn’t leave the wine in the decanter for hours before drinking it — once the sediment is separated, pour the wine into a glass and drink it right away. One final thought: since the point of decanting is simply either to quickly introduce oxygen into wine or to separate out sediment, you don’t actually NEED a proper decanter to accomplish these goals. This might permanently disqualify me from future wine snob status, but I have often used a glass flower vase to do the same thing. Really, any clear container with a bigger surface area than a wine bottle would work for decanting purposes…not that the retailer of the $300 Riedel decanter wants that spread around.